A high-tech and hauntingly beautiful new safety system is on trial in the UK, lighting up the night in the name of cyclist safety. The benefits of bike-riding to physical and environmental health are well known, but there are still detrimental aspects too – mostly caused by the careless operators of larger vehicles. A new technology aims to cut down on the danger to cyclists by implanting a solar-reactive substance into the aggregate in bike lanes and footpaths – causing the lanes to take on an enlightened glow in darkness. The light-up lanes and pathways provide a clear view of the road ahead for cyclists, and a clear view of other road-users for negligent drivers. 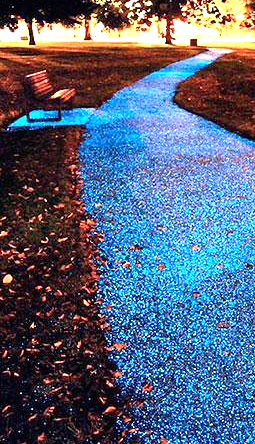 The advanced UV-storing roadways are on trial along a 140 metre track in the idyllic London park, Christ’s Pieces. Aside from the safety benefits of better illumination for cyclists and pedestrians, the ‘Starpath’ technology can reduce the bill from urban street-lighting in some cases too. Cyclist safety is one of the most important emerging issues in Australia. With stats showing 46 cyclists were killed on Australian roads this year. Across our major cities, less than 3 per cent of people ride bikes to work – just 0.7 per cent of commuters ride bicycles in ultra-progressive Sydney. It is reasonable to assume that the often hostile environment created by motorists and inadequate facilities keeps many from seizing the saddle and taking to the skinny lanes. The glow-in-the-dark surface material could go a long way to improving the conditions for cyclists, and various aspects of social health. As the ‘Starpath’ technology is itself an extremely grippy surface, it can reportedly improve the anti-slip properties of the paths on which it is laid. It does not require any modification or removal of existing surfaces either.